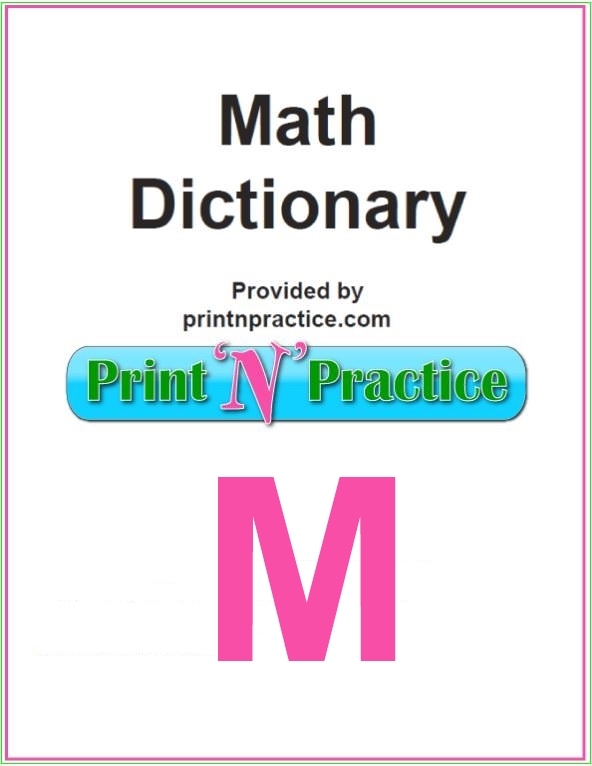 Our Math Dictionary words that start with M have definitions and links to our other pages. We have the most comprehensive list of elementary school Math definitions for words that we have seen in many places. Some are crazy: Malfatti, Mandelbrot, and Mersenne? 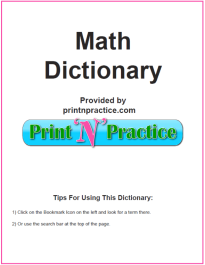 Supplement your math glossary below. Enjoy! 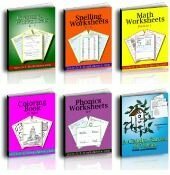 Math Words That Start With M: Supplemental math glossary. 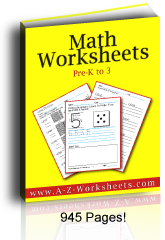 See a free printable math dictionary below the M words. Main Diagonal - in the matrix [aij], the elements a11, a22, ..., ann. Major Axis - the major axis of an ellipse is it’s longest chord. Malfatti Circles - three equal circles that are mutually tangent and each tangent to two sides of a given triangle. Mandelbrot Set - generated by taking the set of all functions f(Z)=Z^2+C, looking at all of the possible C points and their Julia sets, and assigning colors to the points based on whether the Julia set is connected or dust. Matrix - a rectangular array of elements. Maximum - the largest of a set of values. Mean - the sum of a list of numbers, divided by the total number of numbers in the list. Medial Triangle - the triangle whose vertices are the midpoints of the sides of a given triangle. Median - the median of a triangle is the line from a vertex to the midpoint of the opposite side. Median - when a set of numbers is ordered from smallest to largest, the median number is the one in the middle of the list. Mensuration - that branch of mathematics which treats of the measurements of lines surfaces and solids. Mersenne Number - a number of the form 2p-1 where p is a prime. Mersenne Prime - a number that is prime. Metric System - a series of measures whose units are derived from a fixed standard called the meter. Midpoint - the point M is the midpoint of line segment AB if AM=MB. That is, M is halfway between A and B.
Midpoint Formula - the exact point that’s in the middle. Hint: Many of these words that start with M mean the same as in other fields of thought which is encouraging to some students to discover. "Hey, I already know this word!" Math is the first time most of us consider some of these words, as with mean and median. The metric prefixes are good to simply memorize for facility later in life: milli means one thousandth as with milligram, millimeter, and millisecond. Milligram - one 1000th of a gram. Milliliter - one 1000th of a liter. Millimeter - one 1000th of a meter. Millisecond - one 1000th of a second. Minimum - the smallest of a set of values. Minor Axis - the smallest chord of an ellipse. Minuend - the number you are subtracting from. The minuend minus the subtrahend equals the difference, or remainder. Minus sign - the dash symbol - used to indicate that one number is to be subtracted from another. Mixed Numbers - numbers that have both whole numbers and decimals, or whole numbers and fractions. Mode - the most frequently occurring value in a sequence of numbers. Modular Arithmetic - a method for finding remainders where all the possible numbers (the numbers less than the divisor) are put in a circle, and then by counting around the circle the number of times of the number being divided, the remainder will be the final number landed on. Modulo - the integers a and b are said to be congruent modulo m if a-b is divisible by m.
Modulus - a unit of measure. Monic Polynomial - a polynomial in which the coefficient of the term of highest degree is 1. Monochromatic Triangle - a triangle whose vertices are all colored the same. Monomial - an algebraic expression consisting of just one term. Monotone - a sequence the terms of which are not increasing or decreasing. Multimodal Distribution - a distribution with more than one mode. Multinomial - an algebraic expression consisting of 2 or more terms. Multiple - a number that is the product of a given number and some other number. Multiples - the product of multiplying a number by a whole number. Multiplicand - a number to be multiplied by another. Factor x factor = Product where the first factor is also called a multiplicand. Multiplication - the basic arithmetical operation of repeated addition. Multiplication Rule - the probability that events A and B both occur (i.e., that event AB occurs), is equal to the conditional probability that A occurs given that B occurs, times the unconditional probability that B occurs: P(A & B)=P(A/B)*P(B). Multiplication sign - usually the symbol x, sometimes a suspended dot (not used with decimal figures), placing numbers in parentheses nest to each other (3)(2)=6. Also placing variables next to each other 4xyz means 4 times the value of x times the value of y.
Multiplicative Inverse - the number that when multiplied by the original number will result in a product of one. Multiplier - the number which is multiplied times the multiplicand. Factor x factor = Product where the second factor is also called a multiplier. Thank you for visiting our words that start with M.